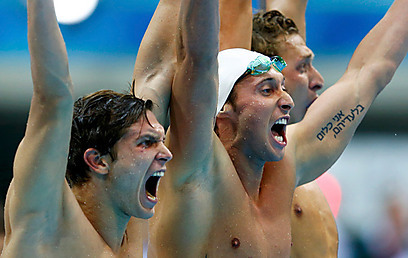 PARIS – When French swimmer Fabien Gilot took to the swimming pool at the London 2012 Olympic Games this week, one person was in Gilot's thoughts as shown by the tattoo on his left arm which read: "I am nothing without them," in Hebrew. The man behind the tattoo is Gilot's grandmother's husband, Max Goldschmidt, a Holocaust survivor who witnessed the horrors of Auschwitz and became one of the most influential people in the Olympic champion's life. Gilot, who together with his teammates brought France a historic gold medal in the 4X100 freestyle relay, created quite a stir in Israel and around the world when his Hebrew tattoo was discovered. The swimmer has previously discusses his tattoos in the French media, claiming "they all have a meaning for me," and adding: "I have the Olympic rings, a sentence in Hebrew that means 'I am nothing without them' for my family and three stars – one for each of my brothers." On Monday his proud father Michel Gilot said that Fabien chose to express his feelings towards his family in Hebrew as a gesture to honor Max Goldschmidt, his maternal grandmother's partner who was "a grandfather in every way." "Max was a Jew who survived the Holocaust and Auschwitz," said Gilot senior. He added: "He was born in Berlin and moved to France after the war, in Fabien's eyes he was a hero. He admired him and was very attached to him." Max passed away this year but Michel said that he got to see his grandson's tattoo and his impressive achievements in the swimming arena, all except his Olympic gold. Fabien's parents Michel and Yveline did not travel to London to cheer Fabien on in person, but they watched their son's Olympic feats from their home, not far from the Belgian border. When he returns to France on August 18, the family is planning a hero's welcome. Meanwhile, Fabien's 2012 Olympic trials are not over just yet – on Tuesday he will attempt to make it to the Olympic podium yet again, when he competes in the 100 meter freestyle. See all talkbacks "French Olympiad's Hebrew tribute to Jewish grandfather"